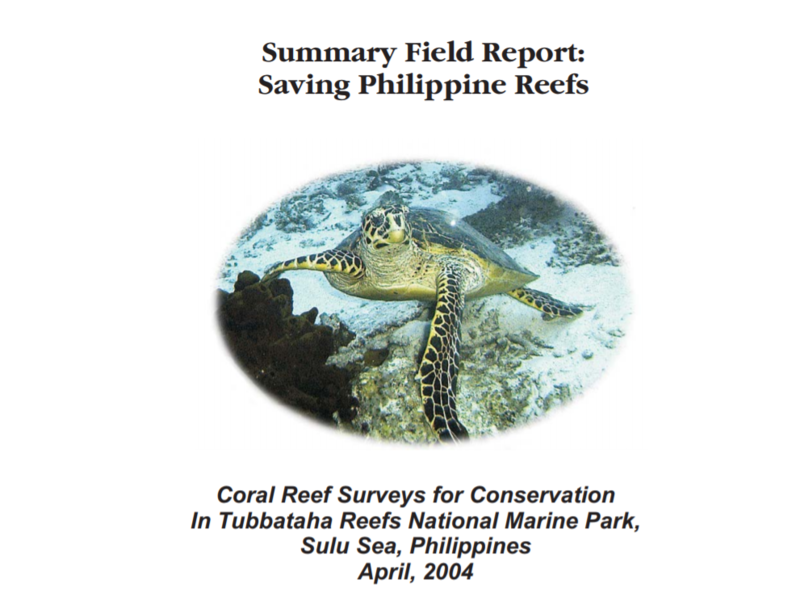 Institution Coastal Conservation and Education Foundation, Inc.
Abstract This project assessed the condition of the coral reefs in the Tubbataha National Marine Park at selected sites and updated information from surveys in 1984, 1989, 1992, 1996 and 2000. Information on the changes in corals, other substratum, fish fauna, invertebrates and causes of damage over time, patterns and trends exhibited and reef health is provided. Recommendations are made for improved conservation and management to the Tubbataha Protected Area Management Board and its partners for sustained management . Live hard coral cover in Tubbataha is in fair condition. Surveys over time indicate that the rise in seawater temperature in 1998 during an El Niño event, contributed largely to changes in the Tubbataha coral reef substrate. Coral cover in all sites declined significantly from the year 1996 to 2000 and the response of each reef exhibited in the year 2004 varied: (1) no significant change in coral cover, (2) recovery in terms of increase in coral cover and (3) recovery in terms of increase in coral cover coupled with a phase shift in the living substrate composition. It appears that the negative impact of bleaching on different reefs is variable and will have different effects on the different Tubbataha sites. Recovery from bleaching and changes in community structure of Tubbataha reefs will likely be driven by the resiliency of hard coral species present in the area, interactions between hard coral recruitment, soft coral competition, corallivory, local current patterns and the depth at which corals grow and future bleaching episodes. Fish diversity and abundance in Tubbataha reefs is fairly high. Large marine life, not common in other Philippine reefs, was consistently sighted in all sites. It appears that fish abundance reflects the relative success of Tubbataha Park management rather than species diversity. Significantly higher fish densities were recorded in NR2 (Ranger Station), SR3 (Black Rock) and SR1 (Lighthouse). It is likely that the distance of the site from the Ranger station plays a vital role in maintaining good coral reef and marine life conditions in a site at Tubbataha. This may be a result of the different levels in patrol enforcement by Rangers due to site accessibility. Identified problems that need to be addressed are: (1) the insufficient capacity of the naval personnel stationed at the Ranger station to patrol the marine park by boat and the need for better enforcement facilities; (2) better aintenance and mooring facilities to prevent damage from the increase in the number of dive boats visiting the area; (3) illegal fishing, although sporadic, is still likely to occur; (4) improvement of the dive-boat briefing system for all park visitors; (5) the need for a regulation on boat waste management; and, (6) the inclusion of Jessie Beazley and Bastera Reefs into the Park area. The status of the coral reef and marine life of Tubbataha Reef National Marine Park has improved significantly over the years. Live coral cover in most sites in 2004 showed significant increases, thus recovery, after the El Niño bleaching episode in 1998. Most large marine life is more abundant than in years past. Since the primary mitigating measure for expected future bleaching events is improved reef management, continued emphasis on reef protection is a must.